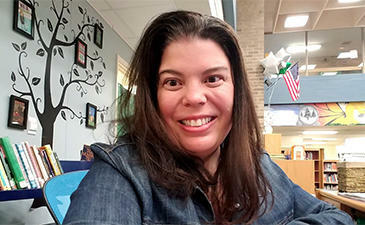 The Media Center at Pinetree Elementary, directed by Melissa, is the heart of her school. As she describes it, it’s one of the first places that visitors see when they enter the building, so she has worked hard to make it welcoming environment and a place of true collaboration. She is passionate about equity—her school serves a diverse population of learners with a wide range of needs. “I have created the Media Center to be a place where challenges are welcome and new adventures await,” Melissa says. “Students often come in on their own, from their lunch recess, to finish a project that was started in library class.” With activities such as Minecraft EDU, building video game with Bloxels, and coding with Ozobots, students are constantly challenged to problem solve with the use of technology. Fun Fact: As part of a March is Reading month initiative, Melissa organized a book drive and successfully created three "little free libraries" around the community. Follow Melissa on Twitter, @MelissaKempski.